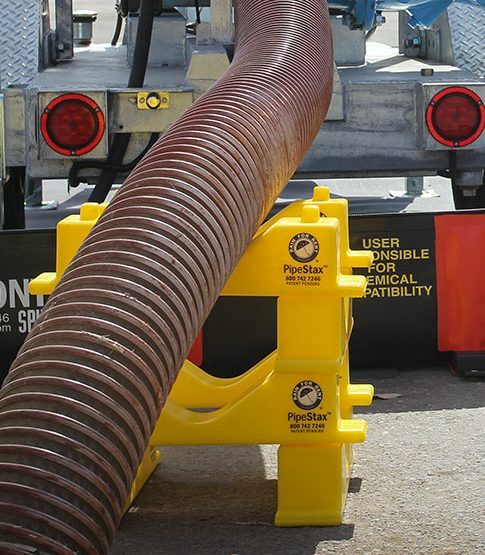 Rain for Rent’s unique WORKSAFE®™ PipeStax®XL are modular and durable pipe support blocks for large pipe applications. By stacking the interlocking PipeStax®XL blocks to your desired elevation, your large diameter hose and pipe will be stable and secure. PipeStax®XL can easily eliminate wooden dunnage entirely. By removing piles of wood from your jobsite, tripping hazards are reduced. PipeStax®XL are reusable, do not splinter and do not absorb liquid like typical wood cribbing. For large pipe applications, up to 24″ in diameter, rely on the support provided by PipeStax®XL. PipeStax act in place of pipe cribbing to provide stability and support to your pipe and hoses. Cradling design prevents pipe from rolling. Stabilizes pipe during fabrication, welding or any temporary application. Modular design makes them easy to secure, stack and adjust to your desired elevation. Prevents pipe or hose from sagging, relieving stresses that may cause premature failure. Bright yellow for high visibility. Spacers allow height adjustments in 2.5″ increments (63.5-mm).